The Kansas Department of Transportation (KDOT) maintains the Kansas Bicycle Guide, which contains some basic information about cycling in the state of Kansas. The centerpiece of the KDOT site, however, is the Kansas Bicycle Map, a free publication that features a detailed map of the state showing suggested cross-state bicycle routes, including such highlights as the TransAmerica Trail and the American Discovery Trail, as well as national and state scenic byways. One of the most useful features of the map are the highway traffic counts and shoulder information. In addition, there are mileage markers so you can see how far it is between towns or turns, and town size and state parks are also denoted. The map even highlights cities with bicycle shops. The other side of the map provides a list of list of state parks and the amenities each supplies, an overview of Kansas Cycling Laws and bicycle safety tips, plus detail maps of selected Kansas communities showing bicycle routes, bike lanes, and bike paths. You can view the Kansas Bicycle Map online (PDF) or order a free hard copy by emailing your request to BikePed@ksdot.org . Please include your name and mailing address in the request. The guide is also available at many public libraries and government offices. Landscapes and lifestyles that hold true to their cowboy and pioneer heritage, big cities and small towns where you'll find rich local flavors and genuine welcomes. Authentic experiences and chances for discovery await in Kansas. Four distinct seasons transform Kansas' landscape, and opportunities come with each one. Camp, fish, boat, hunt, hike, bike, ride horseback in 24 state parks, many with big water and dramatic landscape. And you'll find all sorts of comfortable lodgings and campgrounds along the way. The Byways of Kansas guide "connect travelers with places in Kansas that aren't readily visible from the major interstate routes. The byways help preserve the natural beauty and heritage of Kansas". To order your free Byways of Kansas guide call 1-800-684-6966 or fill out this form. You may also view the guide online. Scenic Byways of Kansas offers a glimpse into each one of these unique byways, along with maps and destinations to experience long the way. A pull-out poster featuring Kansas Wildflowers is included. To order your free Scenic Byways of Kansas guide call 1-800-684-6966 or fill out this form. You may also view the guide online. 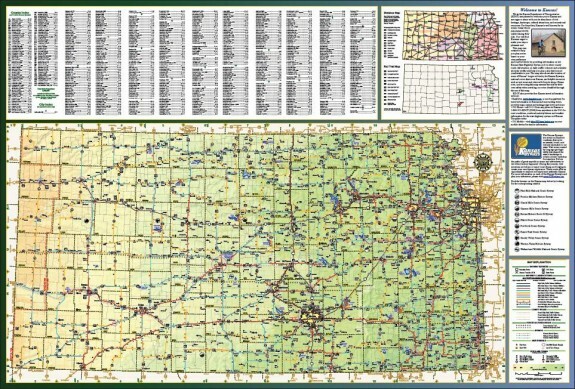 The Kansas Official State Transportation Map provides a fold-out highway map, which includes locations of Kansas State Parks, Point of Interest, National Trails, and detailed city maps. 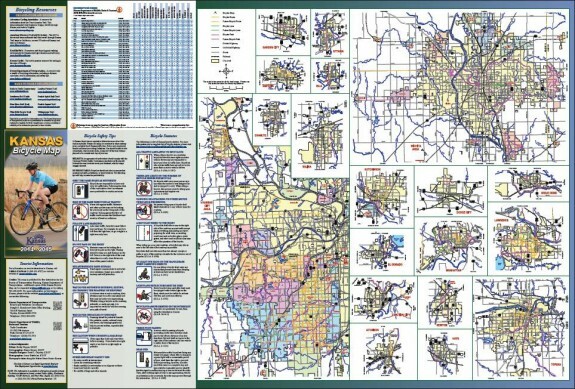 To order your free Kansas Official State Transportation Map guide call 1-800-252-6727, email a request to publicinfo@ksdot.org, or request a map online. The Kansas Trails Council produces a full-color state map called Kansas Trails: A Thousand Mile Adventure, which can be viewed online or you can request a paper copy from their web site. Hutchinson, KS offers a Hutchinson Area Trail Map. To receive a Trail Guide of hiking and biking trails in Johnson County, please use the request form at jcprd.com or view the maps online from their web site. The Mid-America Regional Council offers a map of the Kansas City region's bicycle facilities (including Johnson, Leavenworth, and Wyandotte counties). You can request a copy or view the maps online. Lawrence, KS provides a Bicycle Rideability Map that shows bicyel routes through Lawrence, graded by traffic levels and speeds. The map "assists riders in choosing routes most applicable to their skill level, alerts them to difficult intersections, shows major landmarks to help bicyclists navigate around town and identifies transit connections." Manhattan, KS offers a Manhattan Bicycle Map and Bike Trail Maps. Newton, KS offers a Hike/Bike Trails Map. Salina, KS has a Hike & Bike Trails Map. Topeka, KS offers a Topeka / Shawnee County Trails Map. The Wichita bicycling guide offers an online map of the Bicycle Route System as well as PDFs of individual trails and paths.